This non-suckering chokeberry bush bears little to no fruit. Low Scape Hedger is a great option to red twig dogwood for a flowering hedge. White flowers appear in spring after the green foliage. Growing up to 3.5 feet tall, plant this flowering shrub where you need limited screening. Prune after flowering for shape if needed. 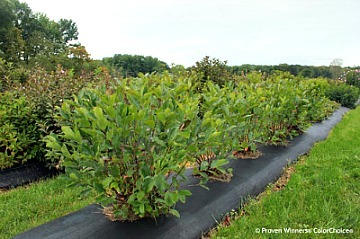 The Low Scape Hedger Chokeberry aronia is flexible for growing in well draining soil, wet soil and dry soil. Fall brightens this shrub with wonderful reds and oranges. For a dwarf size chokeberry bush check out our Chokeberry Low Scape Mound. Chokeberry Low Scape Hedger is a potted plant that ships in a quart size pot. Cannot ship to CA or AZ addresses.